I sold one for 150 euro in January, get uploading again I always look at the average amount I get per sale and they are OK for a microstock site. If you pull your portfolio with them, then you might as well pull it from most of the microstock sites. nothing news under the sun. @sharpshot: If I am correct, Axel already has pulled his port from Shutterstock and some other agencies. Axel, why have you pulled your portfolio from Shutterstock? Are you then exclusive at Fotolia? In that case, since I know that Fotorob has exclusive pictures at Fotolia, how are you guys satisfied with Fotolia exclusivity? I'm asking because I've heard some positive things about Fotolia exclusivity, especially in Europe, so I'm thinking about giving it a try with some pictures. Might as well forget microstock and just use the higher priced sites then? I just find the op strange because mostphotos has been doing this for such a long time. Anyone that can't accept getting paid that little should of left by now. I'm OK with their average, that's what keeps me there. I forgot that they also let you opt out of subs. 0,14 Euro equals 0,15-0,16 USD guys! Opt out from the Monthly package sales. This is scandalous! But it shows one thing: Many contributors opted out from DPC on Fotolia (what I can understand), but are blind to the disastrous pricing models of other agencies like MP, YAY and more! They say they pay always 50%. 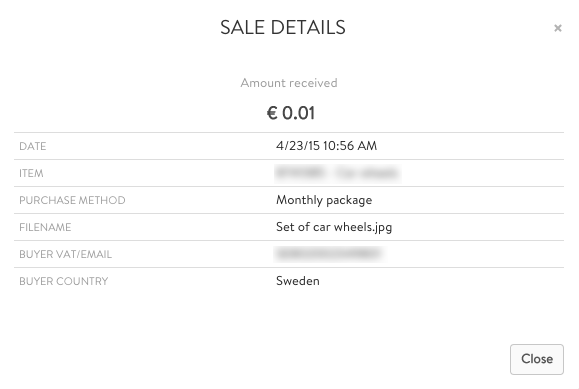 So the image price would have been €0,02. The cheapest package advertised on their site is 250 images / month for $289 / month. Still more than one dollar per image. So if they sell individualized packages that only cost €0,02 per image, that would be a rebate of 98% on that already heavily reduced price. Has somebody from Mostphotos ever made a statement about this? You are so right! I am baffled that someone would of opt out from DPC but accept royalty of one cent!! So glad I never joined the piddly sites like Most, Yay, panther, etc. Did you contact them already? Is this your first €0,01 sale? I got a sale for €0,00 !!! Amazing... Going to send them an angry mail tomorrow, If they don't answer with a reasonable explanation.... bye bye Mostphotos! 0,00 is not a sale, it is a free image. Giving your image free is a violation of the contract when you have not agreed to give free images. I don't think there is a possibility to REALLY donate images "free" on Mostphotos, outside this rip-off Monthly Package system I mean. These rip-off images are sold through the Monthly package system. You need to OPT OUT. I have sales outside the Monthly package, even one 12 Euro sale, so that is not bad. If everyone opted out the Monthly package, they would get a more reasonable pay. So the great day has finally arrived and we are at the finish line of the great Race To The Bottom. PRICES HAVE REACHED ZERO. It may not seem like a lot of money, but keep in mind, these are Sales You Would Not Otherwise have Gotten. Bad Behavior has blocked 58544 access attempts in the last 7 days.